In the video, Robinson lures the cat close to him, boots the unsuspecting feline, and then laughs. Chances are if you are a New York City cat lover who’s been on Facebook recently then you have at least heard of a particularly horrifying video that’s been making headlines around the world. The video depicts a man kicking a cat on the sidewalk, punting it like a football into the air. The hard-to-watch clip has been circulating on the social media site since May 2. The video, posted to viral media Facebook account ON THE REAL, has been shared more than 6,000 times as of Tuesday morning. 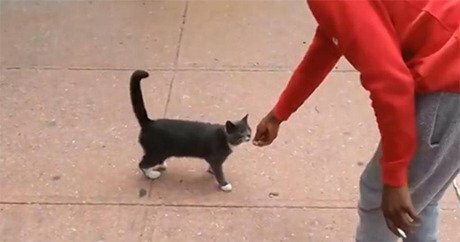 Nearly 1,000 commenters take the cruel cat kicker — and the people heard laughing in the video as a grey-and-white cat flies into the air, clearly injured from the force of the trauma — to task, many offering up some choice words for the cat’s abuser, who is seen on camera coaxing the trusting feline closer before hauling off and kicking the poor kitty. Some included suggestions about how to enhance a still of the gruesome video to figure out where it was shot. And that’s exactly what somebody did. By sharpening the name of the company posted on the scaffolding behind the alleged cat’s abuser, social media users were able to narrow down the possible sites. Determined to draw as much attention to the efforts to uncover the identity of the depraved individual, advocate Michael Cusack started a petition addressed to the New York City Police Commissioner, William Bratton. Cusack and the more than 4,000 people who signed the petition urge the Police Commissioner to focus his investigation around the Brevoort Houses, a public housing project in the Bedford-Stuyvestant neighborhood in north-central Brooklyn. Police headed over to follow the lead, where Brevoort residents were able to help them identify the man in the video as 21-year-old Andre Robinson, who also lives at Brevoort. Robinson has since been taken into custody, where he admitted to kicking the cat. This arrest is Robinson’s ninth (one of his priors was knifepoint robbery). According to the arrest report, the cat flew about 20 feet into the air after Robinson kicked it. While Robinson faces aggravated animal cruelty charges for his heartless actions, his mother, 48-year-old Mary Kirby, is trying to defend her son. “He loves animals. He loved his cats, he had dogs, he always loved them,” she adds. Meanwhile, rescuers are still on the lookout for the cat in the video, who Brevoort residents say has been a fixture at their housing complex for some time. The poor cat hasn’t been seen since the kicking incident.